The Party of Wall Street has ruled unchallenged in the United States for far too long. It has totally (as opposed to partially) dominated the policies of Presidents over at least four decades (if not longer), no matter whether individual Presidents have been its willing agents or not. It has legally corrupted Congress via the craven dependency of politicians in both political parties upon its raw money power and upon access to the mainstream media that it controls. Thanks to the appointments made and approved by Presidents and Congress, the Party of Wall Street dominates much of the state apparatus as well as the judiciary, in particular the Supreme Court, whose partisan judgments increasingly favor venal money interests, in spheres as diverse as electoral, labor, environmental and contract law. The Party of Wall Street has one universal principle of rule: that there shall be no serious challenge to the absolute power of money to rule absolutely. And that power is to be exercised with one objective. Those possessed of money power shall not only be privileged to accumulate wealth endlessly at will, but they shall have the right to inherit the earth, taking either direct or indirect dominion not only of the land and all the resources and productive capacities that reside therein, but also assume absolute command, directly or indirectly, over the labor and creative potentialities of all those others it needs. The rest of humanity shall be deemed disposable. These principles and practices do not arise out of individual greed, short-sightedness or mere malfeasance (although all of these are plentifully to be found). These principles have been carved into the body politic of our world through the collective will of a capitalist class animated by the coercive laws of competition. If my lobbying group spends less than yours then I will get less in the way of favors. If this jurisdiction spends on people’s needs it shall be deemed uncompetitive. Many decent people are locked into the embrace of a system that is rotten to the core. If they are to earn even a reasonable living they have no other job option except to give the devil his due: they are only “following orders,” as Eichmann famously claimed, “doing what the system demands” as others now put it, in acceding to the barbarous and immoral principles and practices of the Party of Wall Street. The coercive laws of competition force us all, to some degree of other, to obey the rules of this ruthless and uncaring system. The problem is systemic not individual. The party’s favored slogans of freedom and liberty to be guaranteed by private property rights, free markets and free trade, actually translate into the freedom to exploit the labor of others, to dispossess the assets of the common people at will and the freedom to pillage the environment for individual or class benefit. Once in control of the state apparatus, the Party of Wall Street typically privatizes all the juicy morsels at less than market value to open new terrains for their capital accumulation. They arrange subcontracting (the military-industrial complex being a prime example) and taxation practices (subsidies to agro-business and low capital gains taxes) that permit them freely to ransack the public coffers. They deliberately foster such complicated regulatory systems and such astonishing administrative incompetence within the rest of the state apparatus (remember the EPA under Reagan and FEMA and “heck-of-a job” Brown under Bush) as to convince an inherently skeptical public that the state can never ever play a constructive or supportive role in improving the daily life or the future prospects of anyone. And, finally, they use the monopoly of violence that all sovereign states claim, to exclude the public from much of what passes for public space and to harass, put under surveillance and, if necessary, criminalize and incarcerate all those who do not broadly accede to its dictates. It excels in practices of repressive tolerance that perpetuate the illusion of freedom of expression as long as that expression does not ruthlessly expose the true nature of their project and the repressive apparatus upon which it rests. The Party of Wall Street ceaselessly wages class war. “Of course there is class war,” says Warren Buffett, “and it is my class, the rich, who are making it and we are winning.” Much of this war is waged in secret, behind a series of masks and obfuscations through which the aims and objectives of the Party of Wall Street are disguised. The Party of Wall Street knows all too well that when profound political and economic questions are transformed into cultural issues they become unanswerable. It regularly calls up a huge range of captive expert opinion, for the most part employed in the think tanks and universities they fund and splattered throughout the media they control, to create controversies out of all manner of issues that simply do not matter and to propose solutions to questions that do not exist. One minute they talk of nothing other than the austerity necessary for everyone else to cure the deficit and the next they are proposing to reduce their own taxation no matter what impact this may have on the deficit. The one thing that can never be openly debated and discussed, is the true nature of the class war they have been so ceaselessly and ruthlessly waging. To depict something as “class war” is, in the current political climate and in their expert judgment, to place it beyond the pale of serious consideration, even to be branded a fool if not seditious. But now for the first time there is an explicit movement to confront The Party of Wall Street and its unalloyed money power. 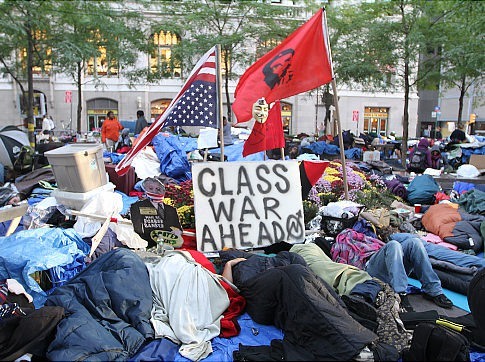 The “street” in Wall Street is being occupied – oh horror upon horrors – by others! Spreading from city to city, the tactics of Occupy Wall Street are to take a central public space, a park or a square, close to where many of the levers of power are centered, and by putting human bodies in that place convert public space into a political commons, a place for open discussion and debate over what that power is doing and how best to oppose its reach. This tactic, most conspicuously re-animated in the noble and on-going struggles centered on Tahrir Square in Cairo, has spread across the world (Plaza del Sol in Madrid, Syntagma Square in Athens, now the steps of Saint Paul in London as well as Wall Street itself). It shows us that the collective power of bodies in public space is still the most effective instrument of opposition when all other means of access are blocked. What Tahrir Square showed to the world was an obvious truth: that it is bodies on the street and in the squares not the babble of sentiments on twitter or facebook that really matter. It says “we are the 99 percent.” We have the majority and this majority can, must and shall prevail. Since all other channels of expression are closed to us by money power, we have no other option except to occupy the parks, squares and streets of our cities until our opinions are heard and our needs attended to. To succeed the movement has to reach out to the 99 percent. This it can and is doing step by step. First there are all those being plunged into immiseration by unemployment and all those who have been or are now being dispossessed of their houses and their assets by the Wall Street phalanx. It must forge broad coalitions between students, immigrants, the underemployed, and all those threatened by the totally unnecessary and draconian austerity politics being inflicted upon the nation and the world at the behest of the Party of Wall Street. It must focus on the astonishing levels of exploitation in workplaces – from the immigrant domestic workers who the rich so ruthlessly exploit in their homes to the restaurant workers who slave for almost nothing in the kitchens of the establishments in which the rich so grandly eat. It must bring together the creative workers and artists whose talents are so often turned into commercial products under the control of big money power. The movement must above all reach out to all the alienated, the dissatisfied and the discontented, all those who recognize and deeply feel in their gut that there is something profoundly wrong, that the system that the Party of Wall Street has devised is not only barbaric, unethical and morally wrong, but also broken. All this has to be democratically assembled into a coherent opposition, which must also freely contemplate what an alternative city, an alternative political system and, ultimately, an alternative way of organizing production, distribution and consumption for the benefit of the people, might look like. Otherwise, a future for the young that points to spiraling private indebtedness and deepening public austerity, all for the benefit of the one percent, is no future at all. In response to the Occupy Wall Street movement the state backed by capitalist class power makes an astonishing claim: that they and only they have the exclusive right to regulate and dispose of public space. The public has no common right to public space! By what right do mayors, police chiefs, military officers and state officials tell we the people that they have the right to determine what is public about “our” public space and who may occupy that space when? When did they presume to evict us, the people, from any space we the people decide collectively and peacefully to occupy? They claim they are taking action in the public interest (and cite laws to prove it) but it is we who are the public! Where is “our interest” in all of this? And, by the way, is it not “our” money that the banks and financiers so blatantly use to accumulate “their” bonuses? In the face of the organized power of the Party of Wall Street to divide and rule, the movement that is emerging must also take as one of its founding principles that it will neither be divided nor diverted until the Party of Wall Street is brought either to its senses – to see that the common good must prevail over narrow venal interests – or to its knees. Corporate privileges to have all of the rights of individuals without the responsibilities of true citizens must be rolled back. Public goods such as education and health care must be publically provided and made freely available. The monopoly powers in the media must be broken. The buying of elections must be ruled unconstitutional. The privatization of knowledge and culture must be prohibited. The freedom to exploit and dispossess others must be severely curbed and ultimately outlawed. Americans believe in equality. Polling data show they believe (no matter what their general political allegiances might be) that the top twenty percent of the population might be justified in claiming thirty percent of the total wealth. That the top twenty percent now control 85 percent of the wealth is unacceptable. That most of that is controlled by the top one percent is totally unacceptable. What the Occupy Wall Street movement proposes is that we the people of the United States, commit to a reversal of that level of inequality not only of wealth and income but even more importantly of the political power that such a disparity confers. The people of the United States are rightly proud of the their democracy but it has always been endangered by capital’s corruptive power. Now that it is dominated by that power the time is surely nigh, as Jefferson long ago suggested would be necessary, to make another American revolution: one based on social justice, equality, and a caring and thoughtful approach to the relation to nature. The struggle that has broken out – the People versus the Party of Wall Street – is crucial to our collective future. The struggle is global as well as local in its nature. It brings together students who are locked in a life-and-death struggle with political power in Chile to create a free and quality education system for all and so begin the dismantling of the neoliberal model that Pinochet so brutally imposed. It embraces the agitators in Tahrir Square who recognize that the fall of Mubarak (like the end of Pinochet’s dictatorship) was but the first step in an emancipatory struggle to break free from money power. It includes the “indignados” in Spain, the striking workers in Greece, the militant opposition emerging all around the world, from London to Durban, Buenos Aires, Shenzhen and Mumbai. The brutal dominations of big capital and sheer money power are everywhere on the defensive. Whose side will each of us as individuals come down on? Which street will we occupy? Only time will tell. But what we do know is that the time is now. The system is not only broken and exposed but incapable of any response other than repression. So we, the people, have no option but to struggle for the collective right to decide how that system shall be reconstructed and in what image. The Party of Wall Street has had its day and failed miserably. How to construct an alternative on its ruins is both an inescapable opportunity and an obligation that none of us can or would ever want to avoid. David Harvey teaches at the Graduate Center of the City University of New York. He is the author of The Enigma of Capital: And the Crises of Capitalism (Profile Press and Oxford University Press). His forthcoming book Rebel Cities: From the Right to the City to the Urban Revolution will be published by Verso in the Spring of 2012. 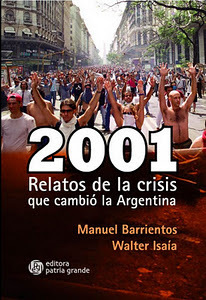 Escrito por Manuel Barrientos y Walter Isaía, este libro es una aproximación a las interpretaciones, análisis, debates y vivencias sobre el estallido, el acontecimiento-paradigma que representaron los días 19 y 20 de diciembre de 2001. A través de cuatro cuerpos de entrevistas se tejen las historias personales y colectivas de los actores sociales y políticos que tuvieron un rol central en aquellas jornadas fundantes en la vida política argentina del siglo XXI. Son voces del campo popular que recuerdan los momentos previos a la emergencia de la crisis, analizan su intensidad y reflexionan sobre las marcas que dejaron en la vida política, económica y social argentina. ¿Alguien previó esa crisis y las revueltas populares? ¿Qué cambios y continuidades significaron para el país? ¿Qué lecturas hizo el gobierno de Néstor Kirchner a partir de 2003, sobre aquellas demandas expresadas en 2001? Las preguntas se suceden y abren posibles rastreos en el imaginario de los distintos actores que participaron de aquellas jornadas. Cuenta con testimonios y reflexiones de Eduardo “Wado” de Pedro (referente de La Cámpora y candidato a diputado nacional por el FPV); el historiador Ezequiel Adamovsky; Luciano Schilaci (secretario gremial de SIMECA); la presidenta de Madres de Plaza de Mayo, Hebe de Bonafini; el sociólogo y ensayista Horacio González (director de la Biblioteca Nacional); el ex diputado nacional Mario Cafiero; la doctora en Ciencia Política María Esperanza Casullo; el economista Daniel Azpiazu (recientemente fallecido); el dirigente sindical Víctor De Gennaro (candidato a diputado nacional del FAP); el sociólogo Christian Castillo (candidato a vicepresidente del Frente de Izquierda); Alberto Spagnolo y Neka Jara (ex integrantes del MTD Solano); el ex diputado nacional Luis Zamora; la abogada María del Carmen Verdú (CORREPI); el dirigente de la FTV, Luis D’Elía; los comunicadores Ximena Tordini y Gastón Montells (ex miembros de FM La Tribu); Cristian Mellado (FASINPAT -Zanón); la periodista Claudia Acuña (La Vaca); el investigador y ensayista uruguayo Raúl Zibechi; y el Colectivo Situaciones. Did the US rate of profit trend upwards from 1982 and when did it peak? The debate/argument continues among Marxist economists. And behind this debate about the facts is the analysis. 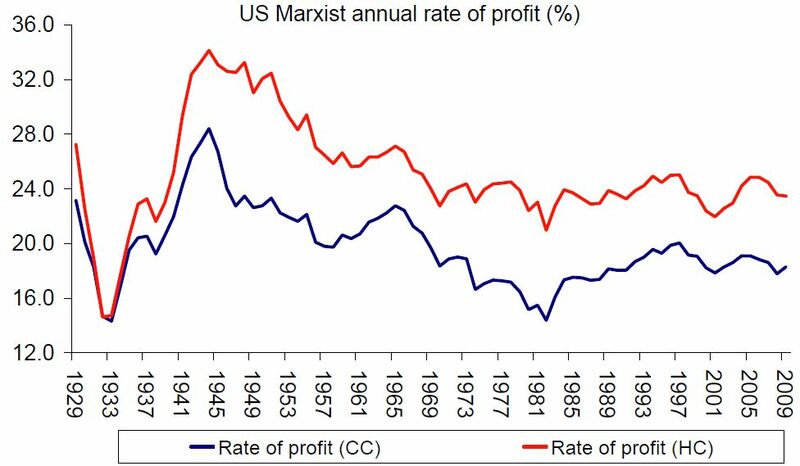 If the rate of profit did rise from 1982 onwards, how can Marx’s law of the tendency of the rate of profit to fall play any role in explaining the financial crisis and the Great Recession of 2007-9? First, did the rate of profit in the US rise from 1982? The evidence is pretty conclusive: it did. In a paper on this presented last summer to the Association of Heterodox Economists (The profit cycle and economic recession), I summarised all the recent studies on this question along with presenting empirical evidence of my own. Let me quickly run through what I found.